If you have fallen in love with the works of Kandinsky, you may be inclined to be mystical and musical and perhaps mathematical. You may also consider yourself an outsider, someone who finds a comfort Zone outside of the box. 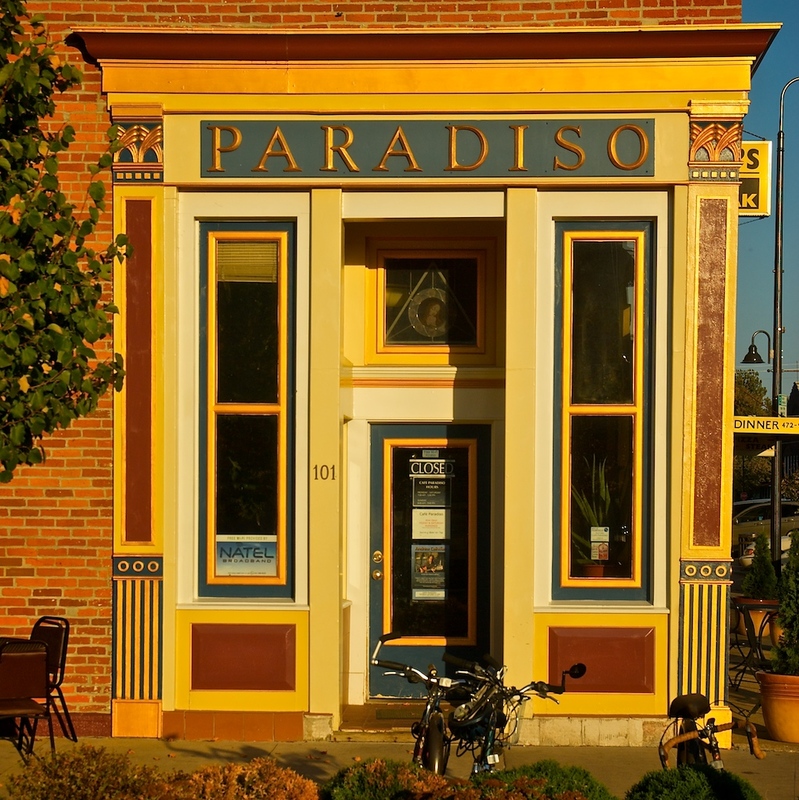 You may be fascinated delving into the esoteric or hidden teachings of philosophers and mystics. You may be a seeker, someone willing to consider alternate realities, and like Neo in the Matrix, willing to take the “red pill,” or like Alice, quite happy to venture down the rabbit hole. You probably asked lots of questions as a child (or wanted to), such as, “Is there a God? Why are kids starving in China? Are my teachers always right? How many stars are there in the sky? Why am I here?” I always found myself asking and wondering and living in my imagination. But, if you only like representational art and believe real art must imitate real things, that one must draw a cat to look exactly like a cat, Kandinsky is not your cup of tea, or coffee, or in my case a latte. Kandinsky is my soy caramel latte. Kandinsky, one of my favorite artists, speaks to me even though he died before I was born. He was part of an artistic revolution that took place in Europe before World War 1 in Europe, and spanned several decades. Unlike me, he was born into an Orthodox Christian family in a small town in Russia, and drew upon the Jewish and Christian stories of his childhood and the mythic themes and symbols of his heritage. He was a genius who drew impeccably and was a brilliant master of his craft. 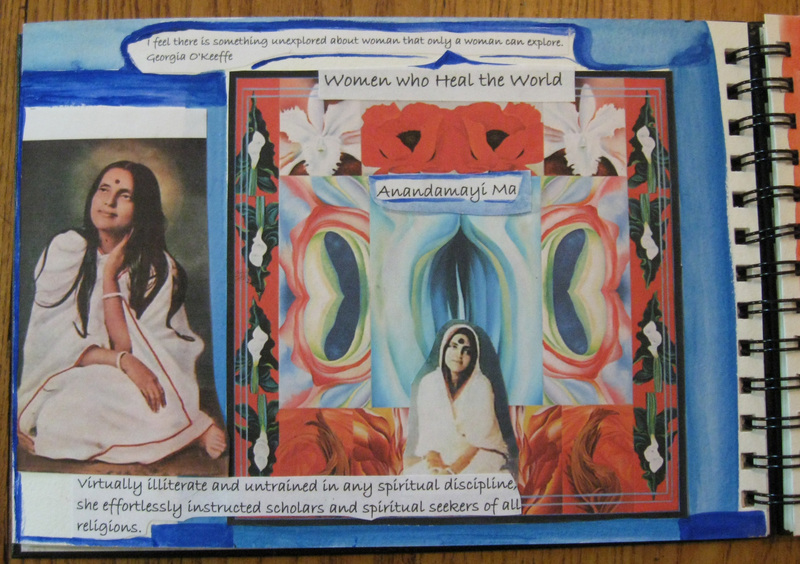 He took art and his insights as a spiritual seeker and mystic to a level where his inner vision fused with his art. He redefined the prevailing world view of what it meant to be an artist. His paintings resemble the stuff of our dreams and imaginations rather than actual renderings of nature. To me, they look like sacred geometry. They look like language, like sheet music, like communication from outer space. He uses line and color as instruments and his work feels musical. Perspective is manipulated and the archaic laws of art making broken, as Kandinsky continued to experiment with new forms of expression and engaged in cutting edge artistic movements (such as the Bauhaus in the 1930’s), and with other artists of his time. 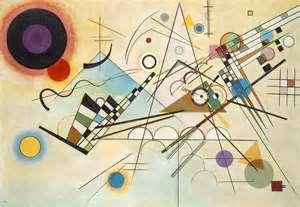 Kandinsky is believed to have had synaesthesia – a gift that enables a person to appreciate sounds, colors or words with two or more senses simultaneously. He was able to hear colors and painted marks that triggered particular sounds or musical notes and vice versa. 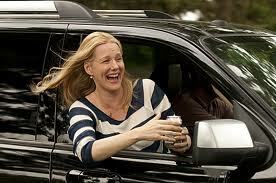 Synaethesia is supposedly a brain wiring issue that is found in one in twenty people. 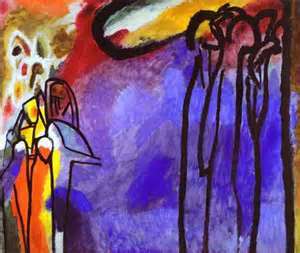 This ability to hear color, see music or even taste words informed Kandinsky’s work. To those of us without this exceptional perception, this is miraculous, mystifying, and sparks our yearning to go beyond the limits of our own senses. Kandinsky brings us into contact with his extra-sensory perception. Artists always push the envelope and must continue to break their own boundaries to evolve. 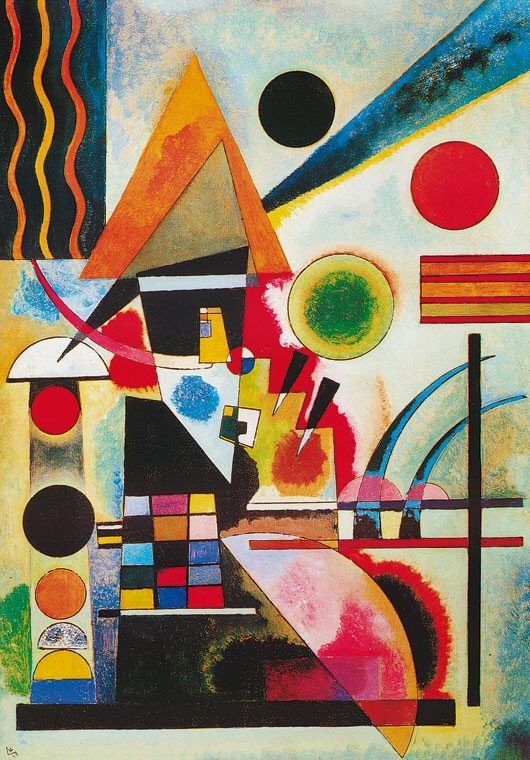 Kandinsky believed the avaunt-garde of today will become common knowledge tomorrow. He saw himself as a kind of modern artist prophet who must often stand alone at the apex of a new discovery in order to usher in tomorrow’s reality. In this way, artists of today stand on the shoulders of the pioneers of the past who broke with tradition, whose work was often ridiculed, who were sometimes imprisoned or persecuted, but continued to remain true to their visions. These artist were visionaries who inspire us to follow our own visions, be true to ourselves, and follow our hearts. I created these pages in my art journal during the painful breakup of a relationship. 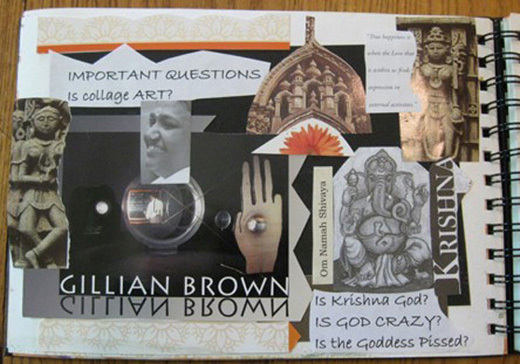 During this period, I used collage and writing in my journals as a way to move past grieving. I understood that artists have an opportunity to deal with their demons by turning to the creative process – so, I would show up at my art collage group with a broken heart and leave with a sense of relief, as if some part of the wounded me had started to heal. Having done some work on dealing with emotional pain, I realized denial would not be an option for me. I was hurting, and pretending otherwise wouldn’t change that. However, expressing myself in a way that was beautiful to me and reflected my honest experience could have a transformational power. It’s as if the energy of grief can be redirected and used as fuel for self-awareness and ultimately used to heal the heart. It doesn’t happen instantly or even by itself, but it can be a powerful part of the process of moving forward. And only by going through the suffering, and that process can be facilitated by the simplest forms of creative expression, can we re-emerge as somehow more complete, more compassionate, and more human. The connection between pain and art is undeniable – human beings have throughout time expressed their emotional, mental, and spiritual despair through some form of artistic expression, whether it’s by singing the Blues, writing songs about love lost, creating fiction that tells stories of the trails and tribulations of the human condition, or by putting onto canvas the extreme difficulties of inner and outer life. And so while it is true that suffering and pain are inevitable in life, there are endless choices we have on how to deal with them. I choose to go to my art journal, drink lattes and watch streaming Netfix. One of my favorite artists, Frida Kahlo, began painting after she was severely injured in a bus accident. Even in the midst of extreme physical pain and emotional disappointment, she was able to develop her work and become one of Mexico’s greatest artists. Her paintings bring tears to my eyes. 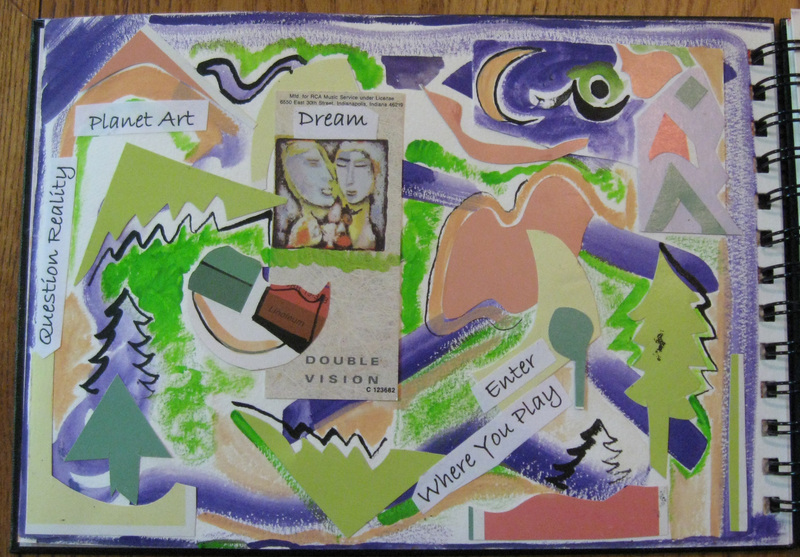 Sometimes I ask myself why I feel so enlivened and connected when I sit down with one of my my art journals – my inner critic starts to harp and nag, telling me I’m just being a bit silly, dabbling around with glue and paper, paint and scissors. Real artists are busy perfecting their craft, my critic chimes in – they are honing the skills that allow them to create real art. But, deep inside I know that is not my truth because my journals connect me to my journey, to that spark inside that can become a bit dim doing real life. “To thine own self be true,” is an adage I try to live by. And of all of the millions of other people who are telling their stories in their art journals, who sit down to enter bits and pieces of themselves in their personal diaries of images, words, and colors, not one of them will ever create a page exactly like one of my pages. So just as each snowflake is a unique expression, every art journal page is a one-of-a-kind expression, like a thumbprint or the structure of a budding flower.